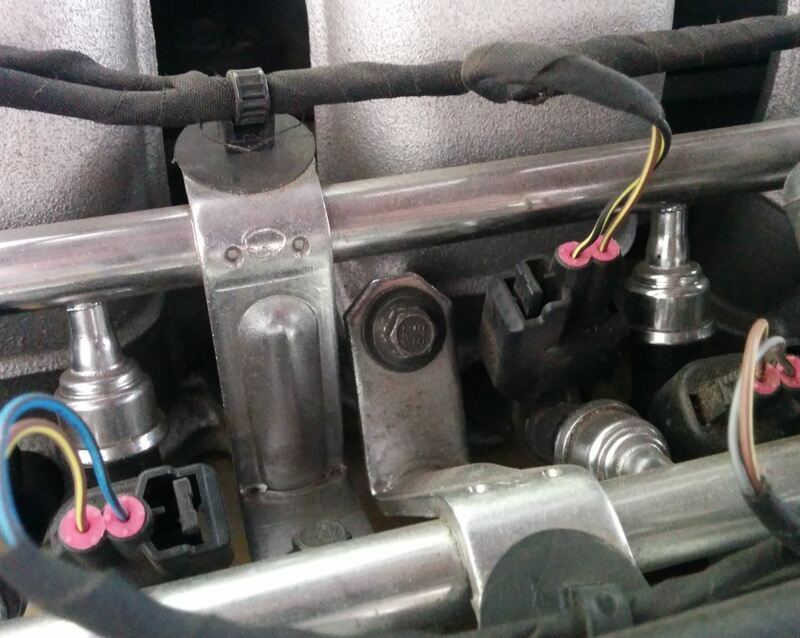 You might be needing to disconnect the fuel rails to change one or more fuel injectors, or perhaps to dig further into the engine removing the Intake Manifolds as part of changing your Coil Packs, Spark Plugs or perhaps your PCV Valves. It’s not a difficult task once you have the prerequisites listed below out of the way. Note: I will be explaining how to unmount the fuel rails and disconnect them from the fuel injectors, but NOT how to completely remove the fuel rail. God help you if you need to actually remove the rails entirely. At the very bottom of this article I will regurgitate the instructions from the Aston Martin Workshop Manual, but I can tell you know it’s probably impossible to do this with the engine in the car. I bought the special tools and was going to try but waved off after seeing mission impossible in front of me. I found it was totally unnecessary for the service tasks I noted above. We can make do with them loose and able to swing side to side. Piece of card board labelled and some holes punched in it to hold the removed fuel injectors (and perhaps your spark plugs depending on how large a service you are doing). See the photo for what I mean, it will make sense then. Warning – There is a real fire hazard in this step. 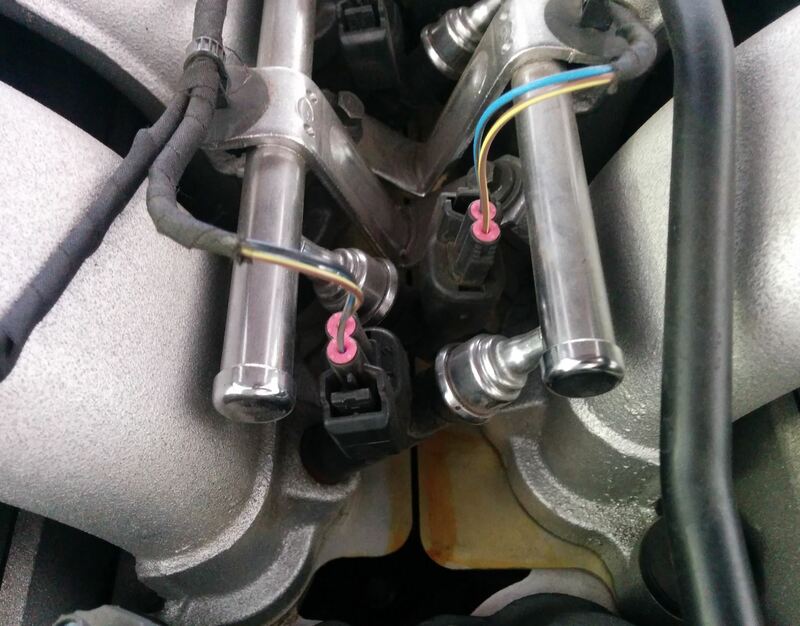 Even with depressurizing the fuel system, some fuel is going to leak out as the fuel rail disconnects from the fuel injectors. Make sure your work space is well ventilated, DON’T SMOKE, and have a fire extinguisher handy. Ya, sounds like overkill right – but you love your car don’t you? Just to clarify, whenever I use the words Left or Right to define the position of something on the car, I am talking about it as if I was sitting behind the steering wheel looking forward (which is the industry standard). The Left front wheel is always the Left front wheel, even if viewed from the front of the car looking back where it would be on the right. I mention this because below and in the video’s, the camera perspective is mostly looking back at the engine (front to back). When I write the Left Intake Manifold, I mean the one on the left from the drivers set perspective, even though it will be on the right side of the video or photo. Left side Intake Manifold is on the same side as the Left Front wheel. Got it? With those steps out of the way we can get onto the work at hand and these set of steps will take you about 15-30 minutes. Disconnect the electrical connection to the engine temperature sensor near the thermostat housing. Just squeeze the connector and pull it out. 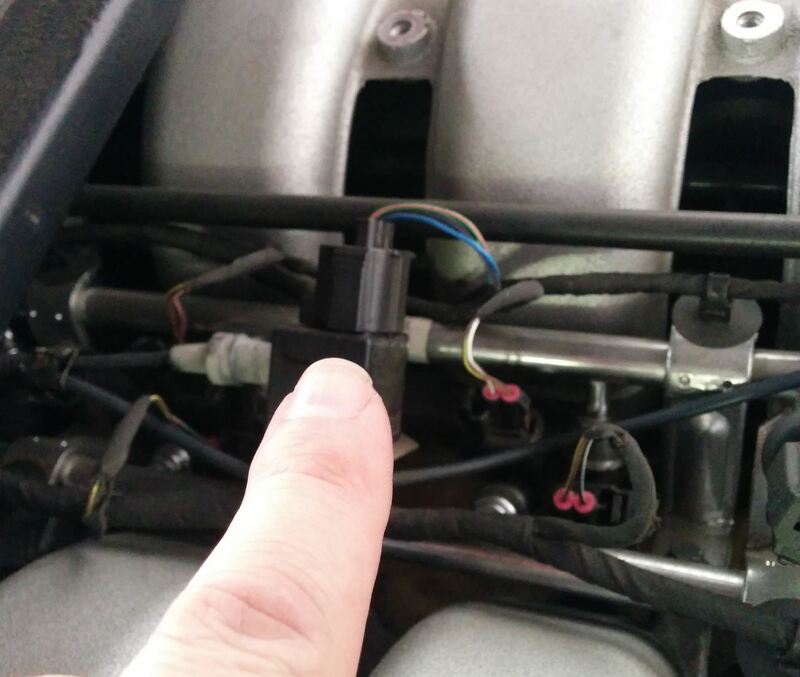 Disconnect the vacuum line from the front fuel rail pressure sensor. OK, how the hell would you know what that is looking down at the mess of wires and tubes? As you move rearward from the front temperature sensor in the previous step, it’s the next sensor. It will have a small right angle rubber hose connection on the front side of the sensor. Just wiggle it off. 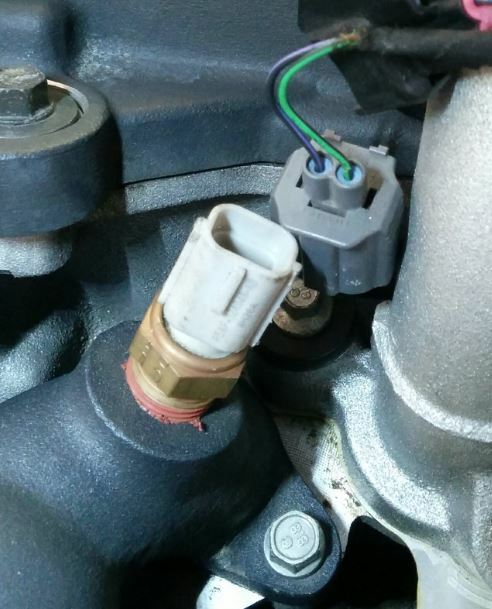 Factoid: Why does the fuel rail pressure sensor have vacuum line attached to it? I would say the answer is because the fuel pressure needs to be computed relative to air pressure within the manifold, not necessarily ambient pressure. 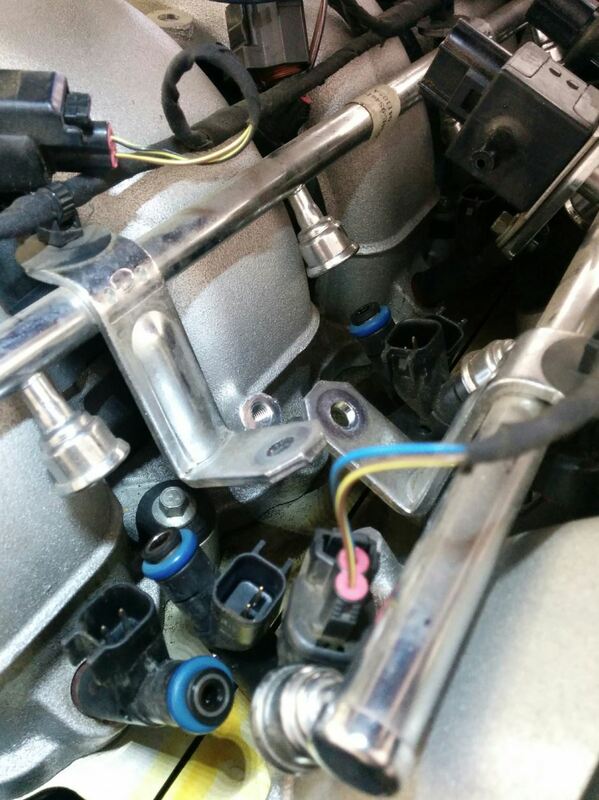 Disconnect the electrical connection from the front fuel rail pressure sensor. This is the same sensor you just removed the vacuum hose from. On the top of it is an electrical connection, just squeeze it and pull it off. 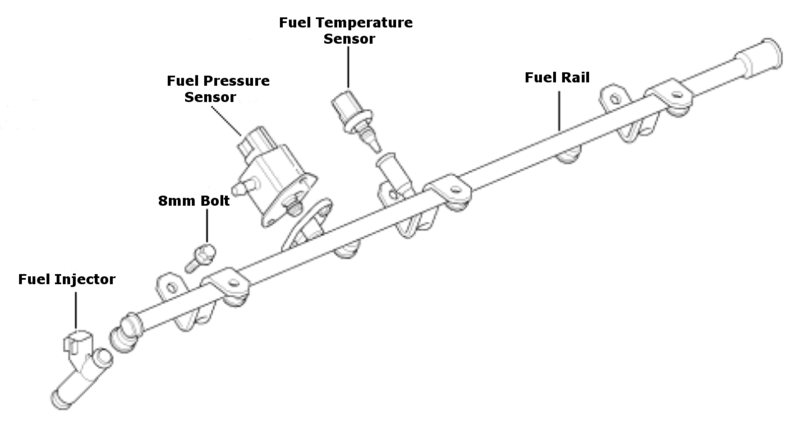 Disconnect the electrical connection from the top of the fuel rail temperature sensor. This is the next sensor you run into as you move rearward from the last one. Just squeeze the connector and pull it off. 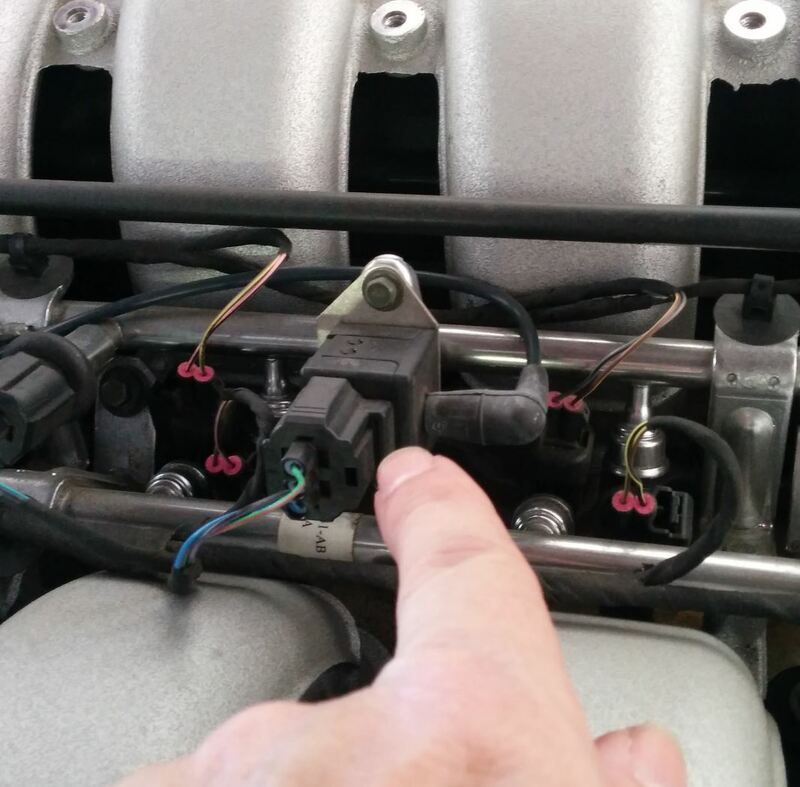 Disconnect the vacuum line and electrical connection from the rear fuel rail pressure sensor. This is the next sensor as you move rearward, and is partly under the cowl and a little harder to reach. Same deal, just wiggle off the vacuum line off the back and squeeze and pull off the electrical connector off the side. 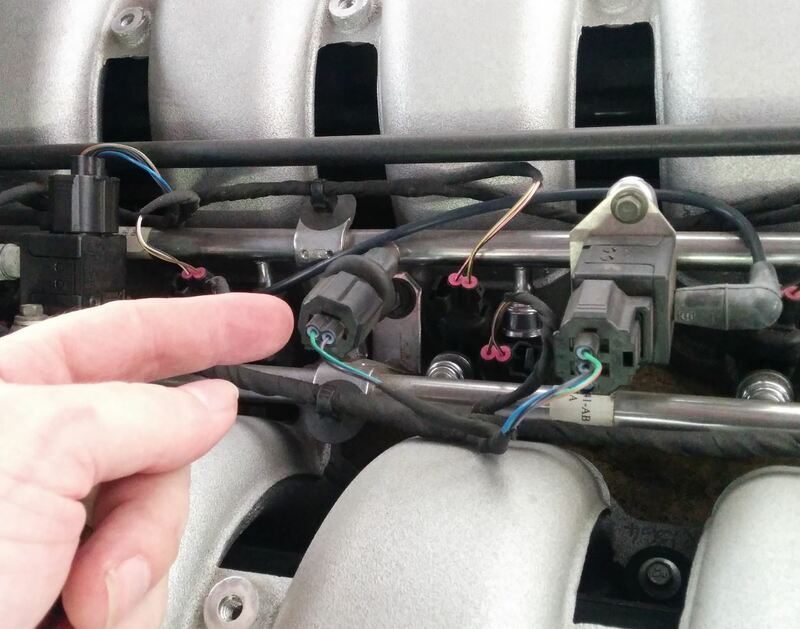 Now disconnect the twelve (12) electrical connectors that plug into the fuel injectors. Just squeeze and pull up and off carefully. The furthest back 2 or 3 connections are tougher since they are under the cowl, but just carefully reach in and you’ll manage. NOTE: In all the steps above I didn’t find it necessary to label the connections. Everything basically only reaches to one natural position. Label them if you feel the need, take photos, else just keep track of them visually. You can always refer to my video below to see what goes where. There are two fuel rails (a left and a right). Each is held in place by three (3) 8mm bolts. What’s confusing is that rail visible on the left side actually provides the fuel for the right hand bank of fuel injectors, and vice versa. They just have them V’d in place. Have a look before you start and you’ll see what I mean. Doesn’t matter much other than in my description below. TIP: In my video you’ll see me struggle to remove the left hand center bolt because the fuel rail temperature sensor is in the way. Putting it back together I learned the trick. Disconnect the left side fuel rail first (by removing the three bolts on the right side), and since the fuel rail temperature sensor is mounted to this rail it will be out of the way enough when you do the other side more easily. Using the 8mm socket, start by removing the front most bolt on the right hand side (this will be disconnecting the left hand fuel rail). Almost as soon as you start to loosen it you may hear a hiss and start to smell fuel. Remove the bolt completely so it doesn’t fall into the engine bay somewhere. This is a good time for me to nag you to be sure you’ve depressurized your fuel system (you don’t want 40 psi fuel spraying you in the face) and have that fire extinguisher handy. Work your way back on the right side and remove the second and third bolts. You may need the 3/8” ratchet, extension and universal joint to get to the third and rear most bolt since its partly under the cowl. Just take your time and remove the bolt carefully as it comes free. Now do the same for the left hand rail removing the three (3) bolts on the right side manifold. Same process. 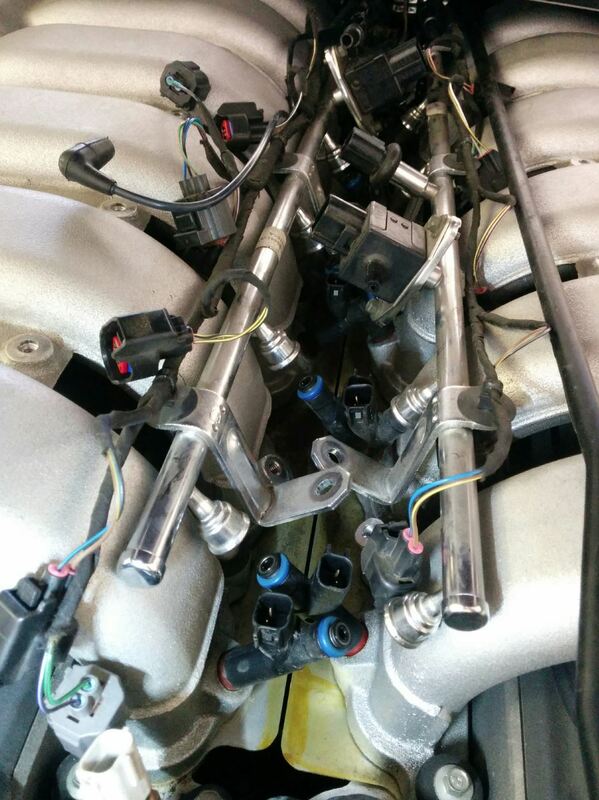 With all six (6) bolts removed, the rails should be free to lift off the injectors. REMEMBER, the rails are still attached at the back to the feed lines, but you can still lift them up, there is a fair bit of wiggle room. 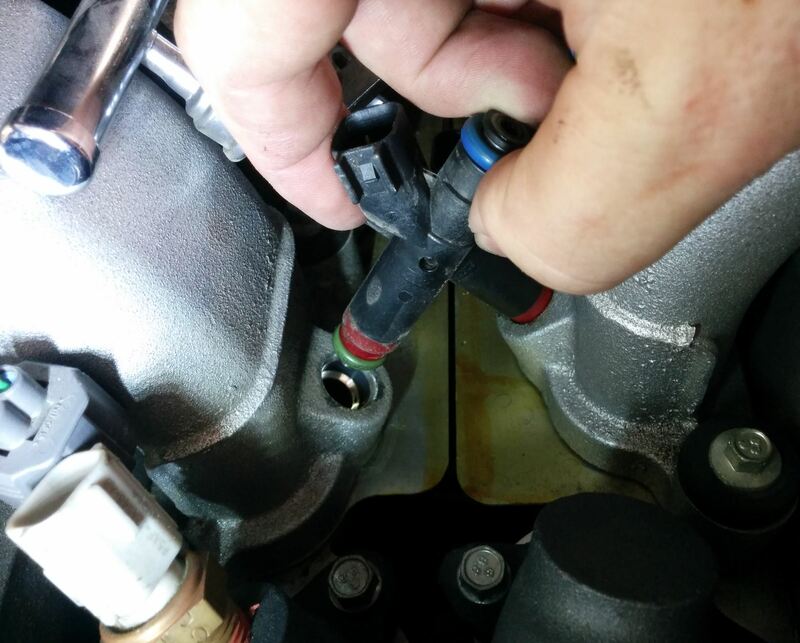 As they lift clear of the injectors, you will get the last the residual fuel spitting out. 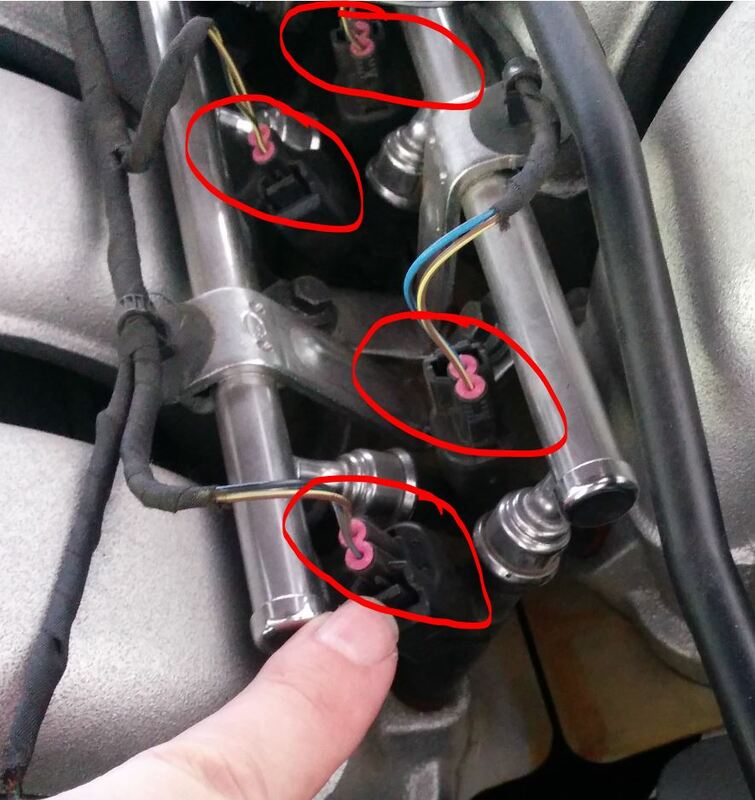 NOTE: When I did it several of the injectors stayed stuck to the fuel rails and lifted out of the manifold. Not a big deal, just keep an eye on them. In my case I wasn’t planning on replacing the fuel injectors, so I wanted to put them back in the same positions afterwards. Why? I dunno, just old mechanic habit, put part back where it came from and you will have less problems. My brain says it shouldn’t matter since they are supposed to be all the same. But my compulsive behavior says to stick them into the piece of cardboard I prepared to keep them organized for later. Of course, if you are replacing them, it doesn’t matter. 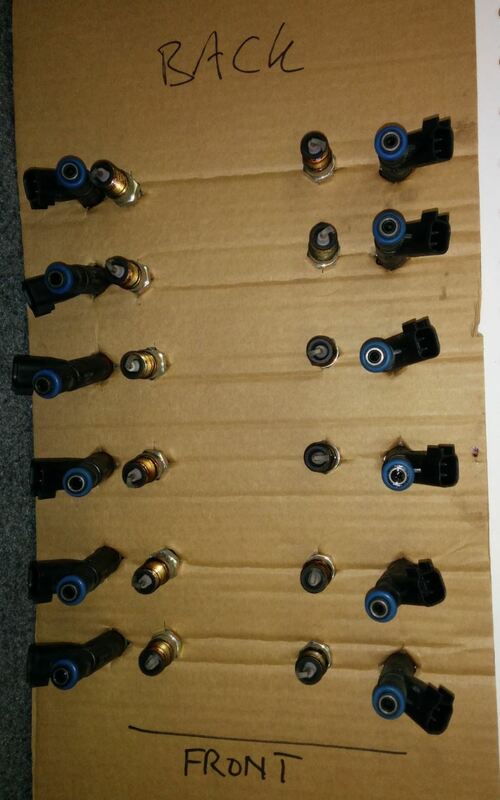 Remove each of the twelve (12) fuel injectors. Easy to remove, just pull on them and wiggle them out of the port (only the friction of the o-ring holds them in place). 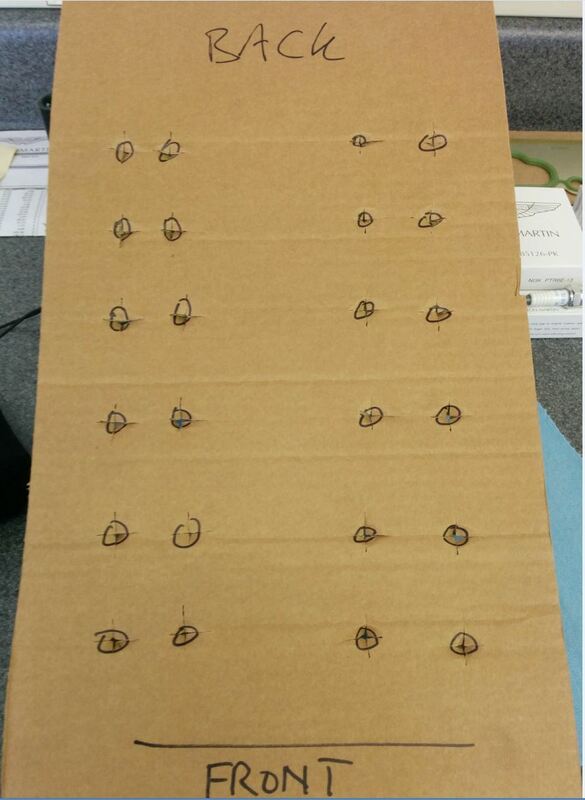 Stick them into the corresponding spots on your cardboard. Just work from front to back, and remember an injector could be stuck up in the rail still. 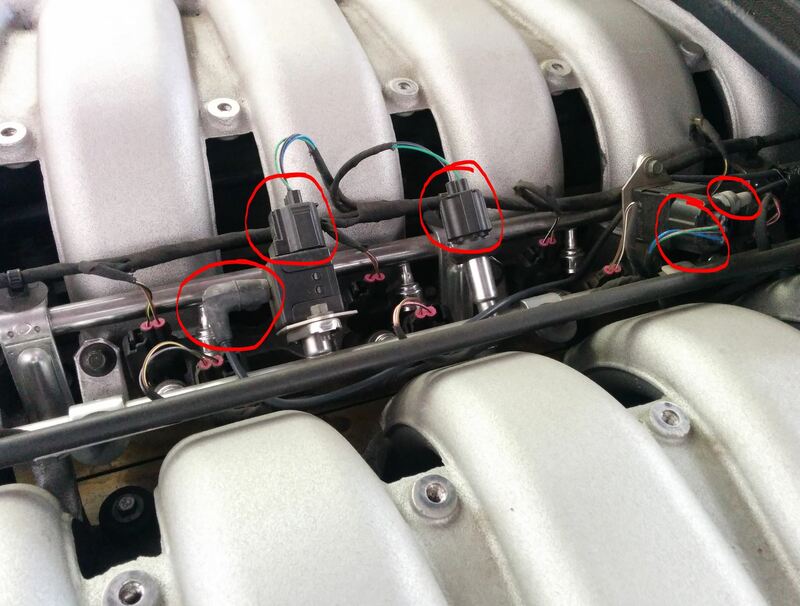 As you get to the last 2 or 3 injectors at the back of the engine, you’ll have some trouble seeing, reaching them again since they are under the cowl. Same deal, just reach in, feel around, and take your time, you’ll manage. That’s it – you should now be ready to move onto the next tasks of your project like disconnecting the ancillary components on the intake manifolds. Great post! What are the cylinder numbers? Do you happen to have a diagram showing which is #1, #2,….,#12? Thank you!